The answer to this question really depends on where the leak is on your water heater. The cold water inlet or hot water outlet valve, then it’s likely due to loose connections. The TPR valve, then it’s likely due to dangerous pressure levels. The drain valve, then it’s likely due to a loose or bad drain valve. The tank itself, then it’s likely that your water heater is corroding from the inside out. Not sure where to start? Don’t worry, we’ll show you where to look for each of these leaks and what you can do to fix them. Need a water heater repair ASAP? Just contact us and we’ll send out a plumber right away. OR browse all our plumbing services for additional service. 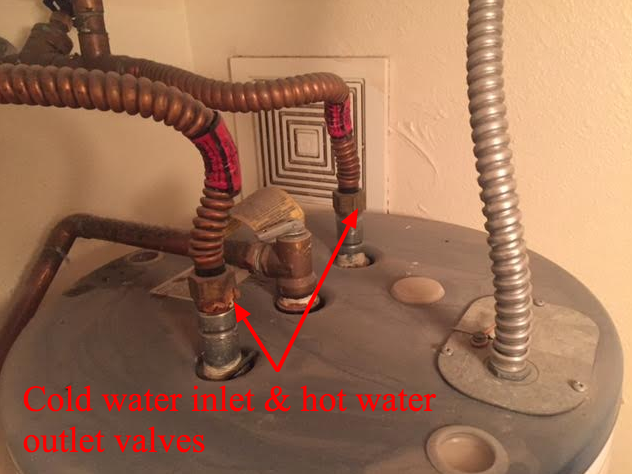 Is the cold water inlet or hot water outlet valve leaking? The good news is that if your water heater is leaking from these valves, it’s most likely because the connections are loose. Use a wrench and try tightening these connections to see if that stops the leaking. If not, you’ll need to have a professional inspect the valves and determine if they need to be replaced. Is the TPR valve/discharge line leaking? The TPR (Temperature and Pressure Relief) valve is a safety device that automatically opens and discharges hot water and/or steam whenever your water heater exceeds safe pressure levels. You see, when water is heated it expands. And sometimes when the water in the tank overheats, it expands so much that it “outgrows” the available space. This can cause the pressure in the tank to rise to unsafe levels and can even cause the tank to rupture. And that’s when the TPR valve springs into action. When this valve opens, it releases hot water to relieve pressure levels in the tank. The hot water is released into the TPR discharge drain, which then directs the water toward a drain in the floor. So you may see water leaking both from the valve itself and/or from the bottom of the discharge drain (usually the discharge drain runs down the length of the tank and stops 6 inches from the floor). Have a professional inspect your water heater immediately. A TPR valve that’s discharging hot water is a sign of dangerously high pressure levels. If ignored, your water heater could burst, causing expensive water damage. Is the drain valve leaking? The drain valve is located at the bottom of the water heater. The water heater drain valve is used by professionals when they drain the water heater of water and remove any dirt/sediment that has accumulated in the tank. If this valve is leaking, it’s most likely because the valve hasn’t been shut completely or needs to be replaced. Try tightening the valve and/or valve connection first. You can use a wrench to tighten the connection but you can usually tighten the valve itself with just your hand. If the leak persists after you’ve tightened everything, have a professional inspect the drain valve. They’ll determine if the valve itself is faulty and needs to be replaced. Is the tank itself leaking? If so, you’ll see water coming from cracks or rusted areas on the water heater tank versus from connections or valves. Unfortunately, if the tank itself is leaking, it’s a bad sign. You see, over time, water heaters will start to corrode from the inside out (water heaters don’t last forever). So once the tank starts leaking from the outside, it’s basically living on borrowed time and it’s only a matter of time until the water heater bursts, potentially causing expensive water damage. Have a professional inspect the tank immediately. They’ll determine whether the tank really is leaking and whether you’ll need to replace your water heater or simply repair it. Need a water heater repair in the NYC metro area? Just contact us by phone or schedule online below! We’ll send out a plumber right away to inspect your tank and suggest repair options.